Those looking to start a career as an education counselor need a blend of relevant degrees and experiences to land their dream job. Most educational institutes prefer candidates who have a master’s degree in education counseling and have completed an internship to develop necessary job-related skills. A test and background check, among other state-specific requirements, may also be necessary. Working adults who have started their career in counseling and wish to progress in the educational arena can opt for an online master’s degree in school counseling. Virtual programs offer students the convenience and flexibility to earn their degree while they continue to work while gaining hands-on experience in the field. According to the Bureau of Labor Statistics, regulations in almost every state mandate that school counselors hold a master’s degree either in school counseling or a related field. Program coursework at the master’s level is crucial to help counselors develop skills that will set them up for success. Among other things, graduates learn to promote academic achievement, engage with others in counseling sessions, and to interact effectively with diverse groups. Individuals with school counseling masters will knowledgeably handle challenges as they occur and adjust counseling framework to be as effective as possible. Requirements for state-issued credentials include a master’s degree and an internship under the guidance of a licensed professional. It also requires passing exam scores and the completion of a background check to work within the public school system. Prior teaching experience is mandatory in some states to work in this arena. Career counselors need a complete master’s degree to practice in the educational space. Some employers prefer candidates with degrees that emphasize career development. A graduate-level program will teach students the qualities of analysis, collaboration, and communication as they relate to their field. It provides them with the ability to critique the skills and preferences of their clients and guide them towards opportunities that match their talents and interests. The advanced degree programs include internships or supervised training to prepare graduates for challenges they could encounter on the job. Some states also require additional steps to gain licensure before individuals can practice as career counselors in a professional capacity. A mental health counselor may choose to work in various professional settings, including the educational space. Those entering this field must hold a master’s degree in addition to completing between 2,000 and 4,000 hours of experience in a clinical setting while under the supervision of a qualified professional. During their training, individuals will gain skills to diagnose and treat various mental and emotional disorders. They also develop the ability to collaborate and work with psychiatrists and social workers to meet their client’s needs. Students also need the required passing scores on state exams for licensures. Once they become practicing mental health counselors, they need to upgrade their knowledge through continuing education. Individuals interested in education counseling should start with an intensive graduate program. They will gain the in-depth knowledge they need for this niche career skill. 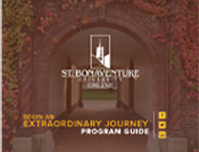 St. Bonaventure University offers a Master of Science in School Counseling that is 100% online and flexible. These programs also have a 95% completion rate with 90% of graduates earning licensure and school certification.